When Google launched Google Contributor last November they promoted the service with the pitch that users would be able to directly support the websites they visited most. The idea most commonly expressed in the media coverage at the time was that users would subscribe and pay anywhere from $1 to $3 a month. The suggested subscription cost went up when the service exited beta in April, but the pitch remained the same, that the money would be split among the sites visited based on how many times a Contributor visited. Or as the Google Contributor welcome page puts it, the program is "a way to directly support the people who create the sites you visit each day". The suggestion that users are directly supporting their favorite sites is, at best, only vaguely related to what is really going on, and I would argue based on my experiences that Google's description is a work of fiction. I have been a member of Google Contributor for the past three months and I can report that my money is not going directly to the sites. Instead, it is being used to buy up the ad spaces on those sites by paying the money into Google's coffers. Before I explain what happened to me, let me point you to some corroborating coverage. This has not been widely reported, but several sites have published reports similar to what I am about to tell you. Nieman Journalism Lab got most of the details right on Google Contributor when they covered the launch last November. Droid Life accurately reported in April on how Google Contributor works, and last week On The Media interviewed David Stanke, the Google Contributor product manager. That last is an 8-minute podcast, thus giving you the option of getting an accurate (albeit incomplete) description of Google Contributor from the horse's mouth. 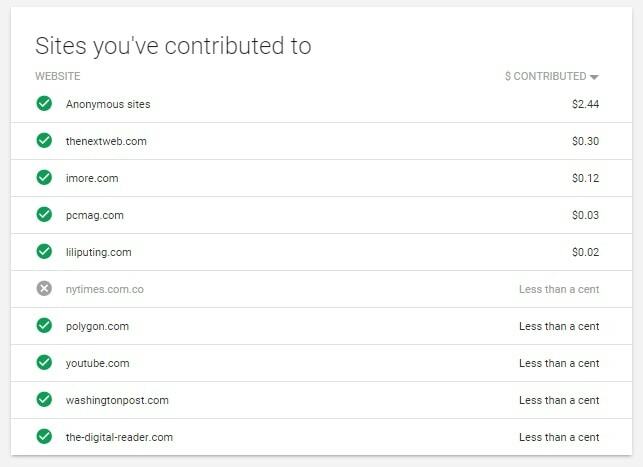 Rather than treat Google Contributor users as direct financial contributors to sites (a la Patreon or direct subscriptions), Google has set up each user as an advertiser on its ad network. Google deposits the monthly subscription fees into its own account and gives each user an equivalent credit that is used to buy ads. When a user visits a site with ads supplied through Google (either Adsense or DoubleClick) the user is sold the ad spaces on that site. The user outbids other advertisers for the option of showing itself white space or some other content (you can also choose to see cats, or upload an image). Google bills the user, deducts part of the user's credit, and pays the site the same amount the site would receive from the regular advertisers. And that is Google Contributor, in a nutshell. There's no real relationship between GC users and the sites they visit. The users are part of Google's ad networks as advertisers and are not directly contributing to any single site. So if you've signed up for Google Contributor with the idea that you were helping sites by giving them extra money, you were mistaken. The sites you visit are not getting any more money from you than they would from other advertisers. As far as the site is concerned, it is a zero-sum game. You're simply paying for the privilege of showing yourself something in place of the usual ads. While that might suit you, do be careful that you don't overpay for the privilege. And that brings me to a detail that everyone has overlooked: what happens to the unpaid credit. I joined Google Contributor on 23 April. I set it up to charge me $10 a month, and was subsequently billed on 23 May and 23 June, bringing the total cost to $30. If you didn't know better, you might assume that most of the money (less a commission for Google) was going to the sites I visit. You would be mistaken. Over the past three months, Google has only paid around $3 to the sites I visit. And to be clear, that's not $3 per site. As you can see in the screensnap from my Google contributor account, Google paid out a grand total of $3 on my behalf over the past three months. What happened to the other $27? According to the Google Contributor help pages, the credit has been rolled over to the following months. So I should have a $27 credit in my account, but I am still waiting to see if that is true. There's no way for me to tell how much credit I still have in my account (nor can I get the money back), but it does appear that the credit is still being applied as of Sunday night, 19 June. However, my next billing period doesn't start until 23 July, so I will have to wait until Saturday before I know for sure that I still get to use that credit. Update: I am still seeing the "thank you for contributing" messages. But what I can say today is that I am no longer going to participate in Google Contributor, and I would recommend that you also withdraw. This program does not give websites any additional funds. It does not let users directly support sites. The only real beneficiary here is Google, which gets to hold on to the monthly subscription fee until it is used up. They don't need any more of your money. If you want to directly support a site, buy something from their store. Back their Kickstarter campaign, or find them on one of the patronage services like Patreon. But I would not try to support the sites you like through Google Contributor, not unless you want to continue to prop up the old system. Guess it’s time to bring back the tip jar icon and let people “tip” the sites they visit. The google thing is a scam. I didn’t want to call it a scam in the article, but that’s what it is, yes. To be more exact, it’s a bait and switch.